Rare and beautiful map illustrating Napoleon's last place of Exile. 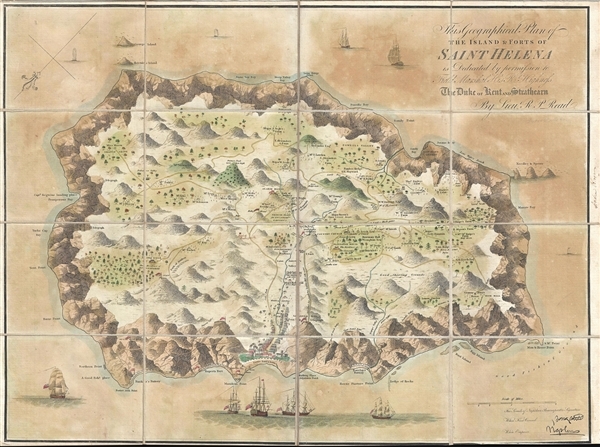 The Geographical Plan of the Island and Forts of Saint Helena is dedicated by permission to Field Marshal His R. Highness The Duke of Kent and Strathearn. A remarkable 1815 map of the Island of Saint Helena, the fallen Emperor Napoleon Buonaparte's final place of exile, by Robert P. Read. After his June 18, 1815 defeat at the Battle of Waterloo, Napoleon sought asylum from the British who promptly exiled him to the island of Saint Helena. Although despised by much of Europe, Napoleon also inspired admiration as the ultimate romantic hero – a persecuted, lonely, misunderstood genius. The English poet Lord Byron immortalized this popular conception of the exiled emperor in his Ode to Napoleon Buonaparte. This map was issued to capitalize on and satisfy this broad public interest in Buonaparte. The map is beautifully executed. Oriented to the southeast, it portrays the remote Atlantic islands as a veritable fortress, surrounded by sheer mountains and reinforced by strategically placed cannon batteries, and British Royal Navy vessels patrolling the sea. The interior of the island, by contrast, is illustrated by verdant greenery, country farms, and gentlemanly estates – very much in the mold of the pleasant English countryside and an appropriate resting place for the romantic emperor's exile. Bonaparte's home one the island was Longwood, appearing here in the lower left quadrant of the island. The image suggests a lordly multistory mansion set in a bucolic forest. The residence was, in fact, the run down summer residence of the island's governor, which, although large, suffered from a brutally cold damp climate, and was, in any case, a far cry from Versailles. The site of Napoleon's tomb on the island, not far from Longwood, is identified in manuscript. In the lower right corner of the map there are facsimiles of Napoleon's signature, first when First Consul, and another when Emperor. There is a manuscript signature in the right margin of the map identifying the original owner, one Andrew Bloram, of which we have been able to glean little. Robert Kirkwood (December 8, 1774 – November 14, 1818) was a Scottish engraver active in Edinburgh during the late 18th and early 19th century. He is the scion of the important Scottish Kirkwood family, who produced a number of great engravers. His father was James Kirkwood, another well-known Edinburgh engraver, and probably the man who trained him in the engraver's art. Initially he patterned with his father and they published under the imprint of 'Kirkwood and Son,' but after about 1814 to his death, he published under his own name. Around 1803 Kirkwood invented and patented a modification to the standard printing press that increased printing speeds. He died at his home, 3 Arniston Place, in Edinburgh. He was survived by his son, also Robert Kirkwood (1798 – 1843) who continued the family engraving enterprise. Good. Dissected and mounted on linen in 16 panels. Even overall toning. Some oxidization to ocean color wash. Lower margin narrow, especially in lower right quadrant where it has been slightly trimmed. Huntington Library, 244738. OCLC 84007218.